As expected, Sony’s God of War didn’t just dominate game sales for the first week it was out -- it dominated the whole month. The NPD Group has just released its sales numbers for the month of April, and the action hit ruled the charts in a number one spot, helping propel Sony to new heights. 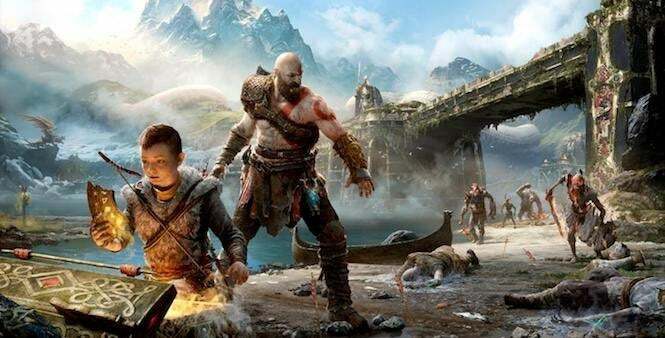 God of War was April's best-selling game: The PS4 exclusive from Santa Monica Studios achieved the highest ever launch month dollar sales for a title launched exclusively on a PlayStation platform. Sony was April's top-selling publisher, driven by the success of God of War. PlayStation 4 software breaks a record: PlayStation 4 software dollar sales in April 2018 set an all-time April high for any platform since tracking began in 1995. The record had previously been held by Xbox 360 and was set in April 2008. MLB 18 continues its strong performance: MLB 18: The Show repeated its launch month ranking from March, once again placing at number three on the April revenues chart. MLB 18: The Show is the year's second best-selling exclusive to date, trailing only God of War. Ubisoft is this years top publisher: Far Cry 5 was April's second best-selling game in dollar sales, and remains the years' top seller. Ubisoft remains the top revenue generating publisher year to date. Nintendo Labo debuts on the charts: Nintendo Labo Variety Kit debuts as the fourth best-selling game of April in dollar sales, while the Robot Kit came in at number 21 on the charts. PlayStation 4 hardware breaks a record: Sony's PlayStation 4 was the best-selling console hardware platform in April, and remains the best-selling console hardware platform year to date. PlayStation 4 generated the highest April unit sales for a Console since Nintendo Wii in April 2009, and the highest April dollar sales for a Console since Nintendo Wii in April 2008. Year to date spending grows: For the 2018 year to date period, hardware spending has increased 14% to $1.2 billion. Spending gains for Xbox One, PlayStation 4 and Plug N Play devices such as the SNES Classic have driven growth. PS4 Pro sales get a boost: The PS4 Pro 1TB Limited Edition God of War bundle was the month's best-selling hardware item in dollar sales, while the Switch 32GB with Neon Red/Blue Joy Con was the leading hardware item in unit sales. Gamepad Sales are up: Gamepad spending increased 7% in April 2018 compared to a year ago and is up 23% year to date. The PlayStation 4 DualShock 4 Wireless Controller Black was April's top-selling Accessory and remains the best-selling Accessory year to date. The PlayStation 4 DualShock 4 Wireless Controller Black is now the all-time best-selling Gamepad in dollar sales. Headset sales increase: Sales of Headsets/Headphones grew 89% in April 2018 when compared to a year ago. Year to date, Headsets/Headphones spending has increased 80%. The Xbox One Ear Force Stealth 600 Wireless Headset from Turtle Beach is the best-selling Headset/Headphone for both April 2018 as well as 2018 year to date. Overall, Sony ruled the gaming charts for April, though Far Cry 5 and several notable Nintendo hits did very well also. And seeing Grand Theft Auto V STILL in the top ten after all this time is really something. Call of Duty: WWII is still a top seller too, even with Black Ops 4 on the horizon. Where will May go? Well, we do have a few hit releases for the month, but we’ll have to wait a few weeks to find out. God of War is available now for PlayStation 4.